The year's second big tournament, the BNP Paribas Open, comes to a close with two unexpected finals. The WTA are fielding their first final between the top two ranked players in the world in the last four years, with World No. 1 Victoria Azarenka taking on a former No. 1 in Maria Sharapova. On the other side, Rafael Nadal came into Saturday looking for another shot at Novak Djokovic in a Masters final...neither will hoist the trophy. Newly minted top ten American John Isner will instead face longtime World No. 1 Roger Federer in what's likely to be a crowd-pleasing men's final in the California desert. How will Sunday's Indian Wells finals play out? Well, we've got a pretty good idea about that one. I will give it maybe three minutes into the broadcast of the women's final before one of the commentators bemoans the moaning. We all know Sharapova and Azarenka are notorious grunters, let's move on already. The crusaders for quiet tennis won't find much quarter in this match. Lovers of big-hitting and strong play on the other hand should have a seat though, as we're expecting a great match from the top two female tennis players in the world. At least a better one than what we saw in Australia where Azarenka romped to the title, surrendering just the opening three games to Sharapova. Since her comeback from a debilitating shoulder injury, Sharapova has had a disturbing case of nerves in the big matches. She lost the Miami final to Azarenka a year ago 6-1, 6-4; the Wimbledon final to Petra Kvitova 6-3, 6-4 and the aforementioned Aussie Open final 6-3, 6-0. For as much as Sharapova deserves her reputation as a steely, hardened competitor; it's almost as if her fighting instinct abandons her in the big matches against the big players. The loooooong Sharapova comeback from shoulder surgery has gone through numerous stages. First, there were the tentative shaky steps to get back onto court at all, serving with a rejiggered motion that robbed her of everything that made her serve feared. Then the Russian battled with consistency, and seemed interminably lodged just outside the top ten for two years. In 2011, she parted with longtime coach Michael Joyce, brought in Thomas Hogstedt and tried to fight the nervy service yips that pockmarked her game at the absolute worst times. Today, Sharapova is ranked higher than she's been since early 2008 (yes, it's been that long). She seems to have largely fought off the yips and the natural next step for the Siberian Siren would be to start winning against the top players again at Premier and Grand Slam events, right? Well, the issue with that line of thinking begins and ends with the name Victoria Azarenka, her final round foe this week. The Bella Belarussian has been an assassin this year. 22 times she's carried her racquet bag onto the court; 22 times she's emerged the victor. We've seen streaks like this before, most recently with Novak Djokovic, where it seems a player can do no wrong. The one big difference between here and Australia is that this time the pressure is squarely on Azarenka. She's established herself as the closest thing we've seen to a dominant women's No. 1 since Justine Henin and the expectation is that she'll keep on winning. Sharapova no longer has the pressure of expectation in this kind of situation. She can swing freely, but will that be enough to derail the Vika Express? 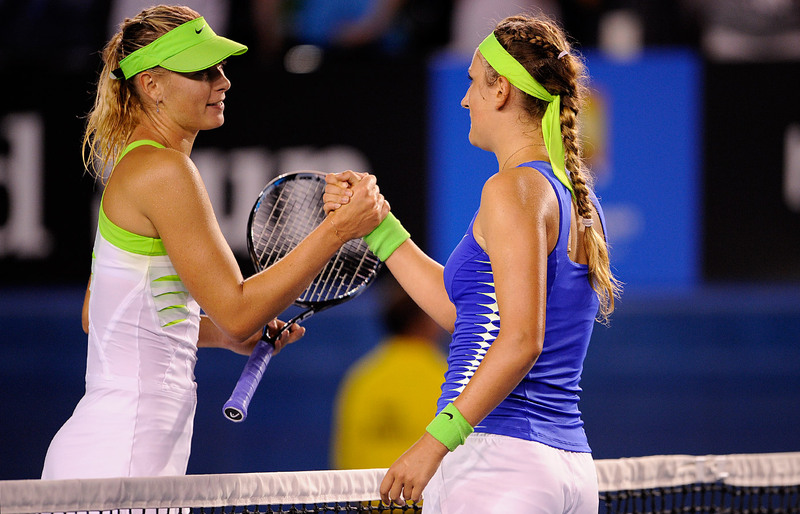 Prediction: Sharapova will play a much more competitive match than she did in Melbourne. Azarenka still wins the title though in three uneven sets. If you called this final, well...drop me an e-mail, I'd like to talk to you about Powerball numbers. Not that either man being here is unbelieveable, it's just a bit improbable. That said, signs were there for those who chose to look. Federer has been en fuego since the US Open. He's done this a couple of times in recent years mind you, dominating the Euro indoor circuit, looking ready to ascend to No. 1 again and then falling back to Earth when the stakes were highest in the Masters and Majors. Keep in mind, when we're talking about Federer, falling to Earth means being a solid No. 2 or 3 versus a potential No. 1. Federer found his way past career nemesis Rafael Nadal in a one-sided wind and rain blemished match 6-3, 6-4 that can only boost his confidence as it was his first real test against a top player since Australia. He also probably isn't TOO disappointed about seeing Isner across the net as opposed to Novak "Robo-Nole" Djokovic who apparently needs a software upgrade as he malfunctioned in two breakers, falling to John Isner 7-6, 3-6, 7-6 in their semifinal. Isner has been creeping his way back up the rankings since last fall as well. He reached the semis in the Paris Masters and even beat Federer (on clay) in Switzerland during the Davis Cup. Yesterday, Isner played in his second consecutive Masters semifinal, this time going one step further, In beating the World No. 1 Novak Djokovic, he secured himself a berth in the Indian Wells final (his first at the Masters level), plus a bonus, his first appearance in the ATP top ten. Can he serve as well as he did against Djokovic for as long as he did in that match? Has he satiated his appetite with his haul to date? Isner's won a half million dollars in prize money, beaten the World No. 1, propelled himself into the top ten and will (theoretically at least) play a doubles final later in the afternoon. For a lot of players, that would be a helluva year, let alone day. If Big John's at the hotel bar halfway through a bottle of Moet, I could hardly blame him. 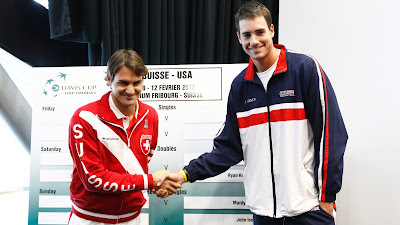 Even setting aside jokes about potential excess in light of his huge day, there's a part of John Isner that has to feel like he's already won this week regardless of which trophy he flies home with. If there's one thing we know about Roger Federer, we know that's NEVER been the case. Won 72 titles? So, he wants No. 73. Been number one for 285 week? Fed wants 286 and a few more for good measure. It's not that Federer's greedy, he just goes out wanting (and half expecting) to win every time he plays. Precious few players have that mentality, not to mention the talent and work ethic to make it a reality. in fact, I can think of just one: Roger Federer. Remember, he only needs to break twice. Prediction: Federer in two tight sets. 12 years after its launch, Maverick is comfortable in its bestseller status. Its identity remains unchanged, but its aesthetics are simpler and more powerful, its movement more imposing. With the monochrome force of audemars piguet replica its dark grey or steel blue tones, this watch is equally at home in the urban jungle or the great outdoors. A PVD-treated stainless steel bezel and alternating sunray satin and circular satin finish on its dial accentuate its depth, while defining touches of Super-LumiNova? enhance legibility.The Maverick’s new aesthetic is faithful to fake audemars piguet Victorinox’s emblematic design codes, with tone-on-tone stamped military hours and a counterweighted second hand in the shape of a Swiss army knife. A red sweep hand signals the presence of a mechanical movement, the first in replica audemars piguet the Maverick collection. A transparent caseback reveals the self-winding Swiss Made ETA 2824 movement.